This fact sheet sets out the processes surrounding a fitness to practise investigation and/or hearing. It also includes explanations of who is involved in each stage of the process, and what the potential outcomes may be. It is recommended that the pharmacist has legal advice and/or representation, however, this can be expensive. Pharmacists who are members of a trade union or defence association should contact them regarding what help they can provide. Pharmacists who are not members of a trade union should note that most solicitors and advocates who specialise in fitness to practise cases are happy to provide an initial telephone consultation free of charge. This can help pharmacists to decide how best to proceed. For a quick outline of the various stages involved in investigations and hearings, see the Pharmacist Support Fitness to practise flow chart. criminal conviction or police caution in the British Isles. In short, pharmacists must maintain appropriate standards of proficiency, ensure that they are in good health and of good character and adhere to the principles of good practice as set out by the GPhC. Pharmacists must inform the GPhC of any change that affects their fitness to practise within seven days. See below under “What happens when a concern is received?” section to find out what would happen once a pharmacist makes a declaration. As part of demonstrating their fitness to practise, pharmacists are also required to undertake and record continuing professional development. For full details of the Pharmacy Order 2010, see the GPhC website. What happens when a concern is received? having a health condition that affects the ability to practise safely. For further information on how the GPhC deals with concerns, see the GPhC website. What concerns will the GPhC not investigate? electronic prescriptions being sent to the wrong pharmacy by a GP or other health official; this should be raised with the relevant regulatory body for the health worker concerned. issues with non-medicinal products sold in a pharmacy. The GPhC is normally not able to consider a concern about something that happened more than five years ago, owing to the difficulties involved in gathering evidence after such a long time, although if it is deemed to be in the public interest, for example in instances of dishonesty, it may investigate cases that go back more than five years. if an order is in the interests of the registrant. Interim orders allow for a pharmacist to be suspended or made subject to conditions at work, whilst the investigation is carried out. The interim order will be recorded on the register and will remain there for the duration of the order. If the GPhC receives information or believes that a pharmacist’s fitness to practise may be impaired, an investigative team will gather information/evidence from a range of sources. The investigation team is led by an inspector or a specialist case worker, or in complex cases, by both. The GPhC will usually inform the pharmacist that an investigation is taking place as soon as possible. The GPhC will only withhold this information if there is good reason to believe that evidence might be destroyed. take witness statements (normally via telephone). Pharmacists can, if they wish, ask the GPhC for further details about a complaint. Once the investigation is completed, if an allegation meets the threshold criteria, it is referred to an investigating committee meeting. The threshold criteria comprises a list of statements that are based on the basic fitness to practise principles, for example, making patients your first concern and being honest and trustworthy. Cases cannot be referred unless there is evidence that these principles have not been followed. For further information about the threshold criteria, see the GPhC website. When all the evidence has been gathered, the case is passed to the investigating committee. Investigating committees are usually comprised of at least four people – a chair or deputy chair, two registered pharmacist/ pharmacy technician members and a lay member. The committee works only from the paperwork that has been collected. It does not meet any of the people concerned, nor does it hear evidence in person, however, it always invites the pharmacist to provide written representations on the allegations made. The committee meets to decide whether or not there is a case to answer. These meetings are held in private and all papers and discussions remain confidential. refer the case to the fitness to practise committee. If the committee received information that the pharmacist had refused to cooperate fully with a medical examination, it could refer that refusal to the fitness to practise committee as a separate allegation of misconduct. For further information on the role of the investigating committee, see the GPhC guidance. Investigations can take a long time to complete. The GPhC aims to complete investigations within six months of receiving a complaint. The GPhC also aims to provide a case update to the pharmacist every two months, although pharmacists can contact the person managing their complaint at any time. If the case is referred to the fitness to practise committee the GPhC will write to the pharmacist, setting out the time frames involved. The GPhC is setting up a pilot scheme to speed up the fitness to practise process. Whilst the system will remain the same, cases will be processed more rapidly and hearings should take place within 90 days of referral from the investigating committee. There is currently no start date for the implementation of the pilot scheme. Pharmacists will receive a listing questionnaire when the GPhC serves its case after referral to the fitness to practise committee. The GPhC aims to do this within six weeks of the referral. The listing questionnaire will already have been partly completed by the GPhC, for example, with details of any witnesses the GPhC will be calling. Pharmacists should fill in the remainder of the questionnaire and return it. The GPhC will expect a listing questionnaire to be returned as soon as possible. Pharmacists will still have some time to prepare for their hearing, but will be expected to start preparing for their defence from the outset. A copy of the listing questionnaire is available on the GPhC website. The pharmacist will be served with a notice of hearing at least 28 days before the hearing is scheduled, unless the pharmacist has agreed otherwise. If either party intends to apply for costs, a schedule of costs form will have to be filled in and exchanged. The schedule of costs form should be done no less than twenty-four hours before the hearing. In the vast majority of cases, no application for costs is made. How long will a fitness to practise hearing take? The vast majority of fitness to practise hearings last from between 2-3 days to a week. Very occasionally, complex cases may take longer. Sometimes hearings can be adjourned and it may then take a while to reconvene owing to the need to ensure that everyone is available to attend. Hearings can take less than the scheduled time if the pharmacist admits to the allegations, as the fact finding section of the hearing will then not be necessary. Review hearings, set up to review cases where the pharmacist has been suspended or special conditions have been applied, generally last for one day. Naturally, attending a hearing can be very stressful; however, the GPhC tries to make pharmacists as comfortable as possible. Pharmacists are escorted up to the centre via a separate lift and the centre itself is a light spacious area, with hot and cold drinks available. The defence and the GPhC have separate waiting areas and there is a private room where pharmacists can meet with their legal representative/s. There are separate rooms for witnesses and the committee also has a small room attached to the hearings room. There are also case presenter rooms for the GPhC. The hearings room is laid out with tables in a square and there are seats for the public to the side and at the back of the room. There may be more than one hearing taking place at the same time, but not in the same room. 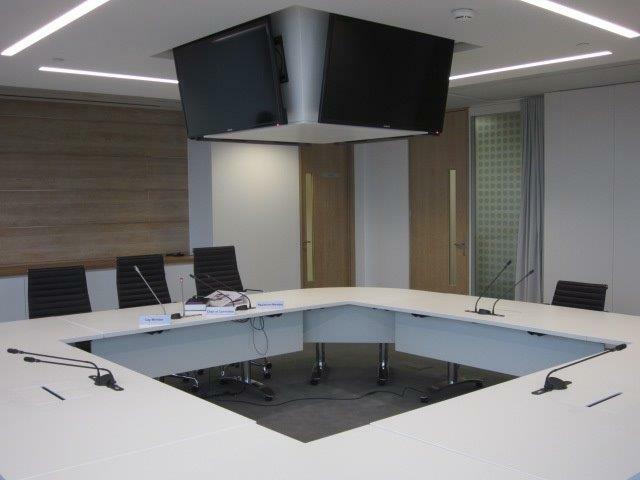 There are physical screens that can be used to protect the identity of vulnerable witnesses and there is also a separate room from which a vulnerable witness can give evidence if required. Each side has a multi-faith room containing prayer mats and washing facilities. There is also a first aid room. To view a photograph of the GPhC hearing centre, click here. It is strongly recommended that pharmacists attend their own fitness to practise hearing. Failure to attend will mean that the pharmacist is denied their opportunity to put their case before the committee face to face. The fitness to practise committee will often proceed in the pharmacist’s absence if it is satisfied that all the documents have been served properly and there is no genuine reason for the absence. It will consider an application for adjournment but this is unlikely to happen if the committee suspects the pharmacist is trying to delay the process. Pharmacists who will be appearing before a fitness to practise committee may wish to consider attending a hearing in advance to see the process at first hand. The GPhC recommends checking in advance to make sure the hearing is definitely going ahead, as hearings can get cancelled at very short notice. Note that health hearings are not open to the public. The fitness to practise hearing process is formal with both parties arguing their case before a tribunal. It is recommended that the pharmacist has legal representation, however, this can be expensive. Pharmacists who are members of a trade union or defence association should contact them regarding what help they can provide. Most solicitors and advocates who specialise in fitness to practise cases are happy to provide an initial telephone consultation free of charge. This can help pharmacists to decide how best to proceed. Some pharmacists may choose to represent themselves. The committee is careful to ensure that unrepresented pharmacists get a fair hearing; however, the pharmacist can still find themselves at a disadvantage. Pharmacists can take supporters, for example, friends and family with them to hearings, however, these supporters do not have the same rights to intervene that a legal representative has. After any legal preliminaries, the hearing will consider the facts of the case. The committee secretary reads the allegations. The Chair will ask the pharmacist if they wish to make any admissions. If a pharmacist admits any factual allegation, that allegation is automatically found to be proved, and no further evidence needs to be called. If the facts are disputed, both sides will call their witnesses and give evidence to support their case. The case for the GPhC is put first, followed by that of the pharmacist. The pharmacist can give evidence if they wish; however, pharmacists who do are often cross-examined. Any criminal conviction will be viewed as proven fact in a fitness to practise case. Denial can be taken as dishonesty or an inability to demonstrate insight into improper behaviour. Even when a pharmacist has been tried and acquitted, this does not mean that the case will not be proven in a fitness to practise hearing. Pharmacists should note that the facts are assessed using the civil, rather than the criminal, standards of proof. The civil standard is lower. The criminal standard is proof beyond a reasonable doubt, whereas the civil standard states that something is proven on the balance of probabilities, meaning that is is more likely than not to have occurred. Once all of the facts have been heard, the committee retires to consider the facts. There are a number of conclusions that the committee can reach. It can find that the facts are proven, partially proven in cases of multiple allegations, or that the facts are not proven. If the facts are not proven, the hearing will end at this stage. There is no actual record kept of the private committee discussions when it retires to reach a determination. On their return the decision is read out in front of all in attendance. Once the facts have been decided and announced, the committee will hear further submissions, and might receive further evidence on the question of impairment. At any point during this stage, if health issues emerge, the committee may adjourn for a clinical adviser to be appointed. For further information on impairment of fitness to practise, see Article 51 of the Pharmacy Order 2010. A pharmacist’s fitness to practice may be regarded as impaired because of matters arising outside Great Britain, and at any time, for example, even at times when the pharmacist was not registered with the council. The committee will consider if the pharmacist’s fitness to practise is impaired at the date of the hearing. This will include looking at the original conduct and ascertaining whether that conduct has been remedied or steps have been taken to remedy it. For further information about the processes involved in reaching a fitness to practise determination, see the GPhC Guidance on drafting fitness to practise determinations on the GPhC website. The committee will then retire to consider what action to take. If there is no longer any risk to the public it would not necessarily be in the public interest to suspend/remove a pharmacist from the register, (for example, if a pharmacist can demonstrate that standard operating procedures are now in place that would prevent a re-occurrence of previous errors). In the more serious cases, for example, non-declaration of criminal convictions or abuse of controlled drugs, remediation may not, in itself, be enough. ask a pharmacist to undergo a medical examination (in a health case). whether the conduct has already been remedied. In instances where the committee decides that the pharmacist’s fitness to practise is not impaired, it can still give a warning or advice. Below are listed the various sanctions and also a brief explanation of what they entail. Warnings do not place any restrictions on a pharmacist’s ability to practise. The warning will be recorded on the register and will remain visible to the public on the online register for two years. Pharmacists who are to be given a warning by an investigating committee have the right to ask to be referred instead to a fitness to practise committee for a hearing. This request must be granted. Conditional registration can be imposed for up to three years and is a sanction that is most often imposed in cases related to health or competence issues. The committee ordinarily uses the GPhC Good decision making: conditions bank for guidance when imposing conditions. This lists the different conditions that can be imposed and what they are for. For further information, see the GPhC website. Conditions are only appropriate where the committee is satisfied that the pharmacist will comply with them, for example, because the pharmacist has shown genuine insight into their behaviour and the potential for remediation. The GPhC will monitor any conditions imposed on the pharmacist’s registration, and if any breach of, or failure to comply with the conditions is discovered, an early review may take place. This will enable the committee to decide whether to continue, modify or end the conditions or to impose another sanction. Pharmacists should note that an immediate suspension can be imposed for any breach of conditions. The condition/s will be recorded on the register and will remain visible to the public on the online register for the duration of the conditions imposed plus an additional two years. Undertakings are an agreement between the GPhC and a pharmacist about their future practice. The aim of an undertaking is to allow the pharmacist to continue to practise, but with restrictions. Undertakings can be agreed where the pharmacist’s fitness to practise can be shown to be impaired and the pharmacist acknowledges the impairment. They are most often used by investigating committees but can also be imposed by fitness to practise committees if they are considered appropriate. A pharmacist who has agreed an undertaking is entitled to work as a pharmacist, however, any breach can result in a referral to the fitness to practise committee. The undertaking/s will be recorded on the register and will be visible to the public on the online register for the duration of the undertaking plus an additional two years. For further information on undertakings, see the Good decision making: undertakings bank on the GPhC website. A pharmacist can be suspended from the register for up to one year, however this can be extended at a review hearing. Ordinarily, this suspension begins 28 days after the hearing. This allows time to put affairs in order before the suspension begins, and/or appeal against the decision. In some instances of short periods of suspension, there will be no review hearing. In most cases where a suspension has been imposed there will be a review hearing to determine whether the pharmacist can return to practice. In the more serious cases, the GPhC can apply for an immediate suspension to cover the 28 day appeal period. The suspension will be recorded on the register and will remain visible to the public on the online register for the duration of the suspension plus an additional five years. Removing a pharmacist’s registration is reserved for the most serious conduct. The committee cannot impose this sanction in cases which relate solely to the pharmacist’s health. According to the GPhC guidelines, the committee should only consider this sanction when the pharmacist’s behaviour is fundamentally incompatible with being a registered pharmacist. The GPhC can apply for immediate removal (rather than wait for the result of an appeal) if it is considered appropriate. After a period of five years, someone who has been removed from the register can apply for restoration to the register. Statistically, restorations following removal are rare, however the fitness to practise committee does recommend that anybody planning to apply to be restored to the register should start making plans from day one of their removal. For further information on all aspects of hearings and sanctions, see the Good decision making: fitness to practise hearings and sanctions guidance on the GPhC website. prevent them from making further applications to be restored to the register. return the case to the GPhC or the fitness to practise committee with instructions for how it must proceed in relation to the case/outcome. The court may also make an order for costs or expenses. Pharmacists should note that the decision to remove will not be recorded on the GPhC register whilst it is subject to appeal. If the appeal fails the decision will then be recorded on the register. The GPhC will publish hearing determinations in cases where a pharmacist’s fitness to practise is impaired, unless the matter relates to the health of the pharmacist or the hearing has been held in private. Note that any sanctions imposed in private hearings will still be recorded on the register. The determination will remain on the GPhC website for a period of twelve months. For further information on the GPhC publication and disclosure policy, see the GPhC guidance. We are very grateful to the GPhC for all their help in producing this fact sheet.